Do you have a child between the ages of 2 and 5? Join us at Torah Tots! 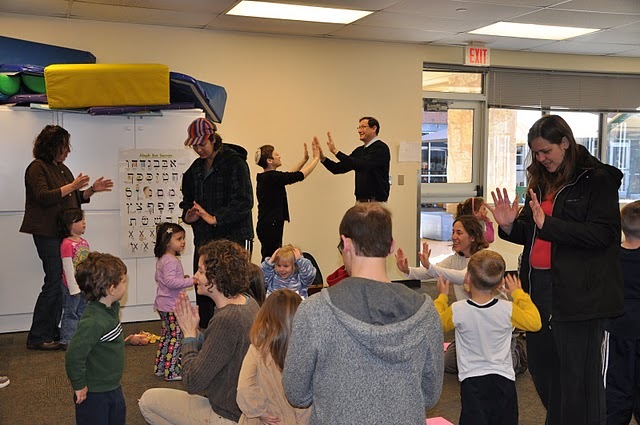 Torah Tots is an engaging, family-learning experience for young families.We sing, dance, spend time with Rabbi Freedman and Rabbi Cohen, complete craft activities, read stories, and enjoy being Jewish together. The program meets once a month (from September 2018 to May 2019) on Sunday mornings from 9:15-10:45. Enrollment is open to both members of Temple Beth Shalom and the greater community, with enrollment capped at 30 families. Torah Tots is free for Temple Beth Shalom members and $50 per family for non-members. To sign up for the 5779 (2018-2019) year, please fill out the Torah Tots Registration Form. If you have any questions at all, please contact membership@bethshalomaustin.org or call 512-735-8900. We can't wait to learn with you! Torah Tots is a program designed to nurture Jewish identity among our youngest members. Toddlers and preschoolers will learn about what makes them Jewish and be exposed to Jewish traditions, symbols, and values by engaging in song, dance, arts and crafts, storytelling and time with our Rabbis. Torah Tots is a school year program which involves eight, one and one-half hour sessions. Each session has its own theme and will consist of singing both songs of prayer and colloquial Hebrew tunes, story time, meeting with one of our Rabbis, a theme-related activity and art project. The program aims to create fun, tangible ways for our children to understand their faith. The program will maintain a learning environment in which our Temple tots can grow and explore their Jewish selves. Activities will be designed to be age-appropriate for children ages 2-5 (pre-kindergarten). Together with their parents, children will work in a large group, as well as smaller groups of mixed preschool ages in a family-oriented learning experience for all. Familes with children between the ages 2 - 5 (pre-kindergarten). Must be 2 years old by date of first class. Prior to registering, parents are expected to use their discretion to determine whether their young two-year-olds are able to attend to four 15-minute segments and engage in listening to stories and instruction, hands-on creating, and active playing at the appropriate intervals. Please note that Torah Tots is designed as a pre-religious school program geared toward learning for our 2-5 year olds. If childcare for younger or older siblings presents a problem for regular attendance, please contact Torah Tots Chair (contact info below) to discuss options to enable your full support and participation. Each participating child must be accompanied by an adult; however, one adult may bring more than one child as long as active participation with each child can be maintained. This program encourages and relies upon FAMILY learning, so it is essential that parents are fully available and take on an active role in the program alongside their child(ren). Active adult participation is expected as we are trying to create a learning environment for the family. Torah Tots is free for current Temple Beth Shalom members, and open to non-members for $50 per family. A limited enrollment is maintained to ensure that a favorable learning environment is upheld. Enrollment is based upon a first-come, first-served basis with priority given to previously enrolled participants. contact membership@bethshalomaustin.org or call 512-735-8900.